Solar power has become a more attractive and affordable way to lower your energy bill and produce your own energy. However, many interested consumers – homeowners and commercial business owners – are still unsure about how they should go about evaluating whether solar is right for their situation. Solar is potentially a large investment, so it’s advisable to look into both the technical and financial considerations before either getting the wrong solar panel system or dismissing the chance to save with solar. I’ve complied helpful tips into a 5-step process to determine whether solar is right for you. #1 – Research solar power. The first thing you need to do is understand the basics of solar power and what the benefits are. There is a ton of information out there on government, utility and blog websites about solar power which may be a bit overwhelming, so try visiting a site like My Energy Solution which has condensed the information for you in a consumer friendly way. How much might I be able to save? Once you have completed this basic research, you will be ready to move on to the next step. #2 – Find a solar installer. You want to find a professional solar installation company who will be your partner to make sure that your solar experience is positive. The professionals have been trained to make the process of determining the financial payback, applying for rebates and tax credits and building permits extremely easy for you. Unfortunately, as with any rapid industry expansion, there are some solar providers that are less than trustworthy and are simply out to take advantage of unsuspecting consumers. I recommend using top quality certified installers which can be found through third-party listings and matching services. Checkout these tips to make sure that you select the right solar installer for your home solar project. #3 – Prepare for a site visit. After you have selected your solar installer, they will schedule a site visit to assess your home. To prepare for their visit, simply have you have the past 12-24 months of your monthly electric bills available. The purpose of the site visit is as follows: Your monthly electric bills will determine the size of the solar system for your home. Typically, the higher your electric bills, the bigger the solar system you will be eligible to install. Your solar installer can help you gauge what size of solar system you need based on how much energy you want to produce. Once you and the solar installer determine what size of solar system you want, the installer will need to inspect your roof to make sure that you have enough sunlight to power the solar system. Lastly, the purpose of the site visit is for the solar installer to finalize his estimate for you in preparation for a formal bid. #4 – Apply for rebates and financing. Many people erroneously assume that they have to pay for the entire cost of a solar system up front. Make sure you ask your solar installer and about all the applicable tax incentives and rebates. For example, there is a federal income tax credit for 30% of the cost of the solar system. In addition, states like California, New Jersey and many others, actually offer you cash back for purchasing a solar system. 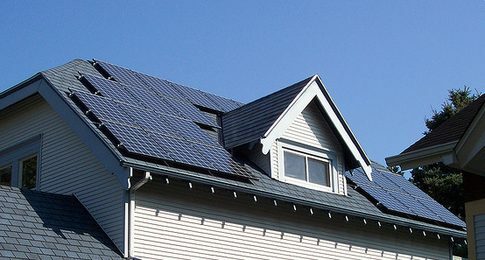 In addition, there are a number of financing mechanisms like home equity loans, leasing, and power purchase agreement that can make the purchase of your solar system easier and spread out over time. Your solar installer can help you with all the appropriate paperwork. There are also a number of rebates and financing incentives available. Once you’ve gone through all the above steps and accumulated all the information you need, it’s time to make a decision to go solar or not. If there is anything you are uncomfortable with, go back and ask more questions until you are clear. Installing solar power is a rewarding but substantial investment so you need to be absolutely sure of each element of this process. Have you ever looked into installing a solar power energy system on your house? What was your experience with the process? I believe that basic and straightforward consumer education about clean technology can help not only unlock customer demand for these products and services but also help consumers save money in trying economic times.